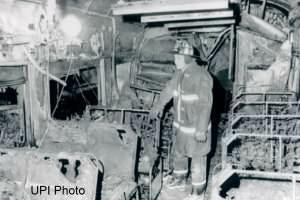 On December 28, 1966, a horrific train crash occurred at the Second Street railroad crossing in Everett, MA. A single car commuter train, then known as a Buddliner from the manufacturer's brand name, crashed into an oil truck that had stalled on the tracks. The Boston & Maine Railroad train left North Station at 12:01 am, and was carrying about 25 people. Some of the passengers had attended a Bruins game that night. The train was completely engulfed in flames when it struck the oil truck, trapping the passengers inside. Twelve people tragically lost their lives, including the conductor. Second Street at East Everett and Chelsea is a high-traffic road. Vehicles from Route 16 in Everett use Second Street to get to the Tobin Bridge, and to go to Logan Airport via East Boston. The street is also part of a truck route through Chelsea that once contained an area of large fuel storage tanks, called "oil farms." Second Street in 1966 was still paved with cobble stones, and was quite pitted. The railroad crossing was four tracks wide at the time of the accident. The driver of the oil tanker was following another truck, when his brakes jammed and the vehicle stalled in the middle of the grade crossing. The safety gates then activated signaling an approaching train, closing in front and behind his stalled vehicle. He ran toward the train waving his jacket, but the speeding train was unable to stop before striking the truck. The tanker was carrying about 7,000 gallons of heating oil. The conductor of the train saw the oil truck and ran into the passenger compartment yelling, "Get Down, Get Down, we're going to Hit!" The Buddliner slammed into the truck and the tank exploded, spewing the liquid onto the car and totally engulfing it in flames. The impact pushed the truck 300 feet down the track, and tossed a piece of the train about 125 feet away from the crash site. All of the passengers were trapped inside the burning car. The doors of the train were jammed shut from the impact of the collision, with the windows being their only method of escape. The windows cracked from the heat, and the truck driver tried to break them until firefighters arrived. The crash scene was horrific, with witnesses saying that many of the passengers were blackened or even burned like charcoal. Firefighters smashed the windows and pulled as many victims out as possible. The firefighters had to endure intense heat and thick black smoke, while spraying foam onto the wreckage. It is amazing that so many passengers had even survived the accident. As a result of the crash, on March 16, 1967, the speed limit was reduced from 60 mph to 35 mph for passenger trains in a one mile stretch of track in the area. The accident was a huge tragedy, with at least a dozen people losing their lives. In the early 1970s, this editor had actually observed cars driving around closed gates at the Second Street crossing to save time, on several occasions, which was incredibly stupid and dangerous.